The Bonan-Jeener's triple Klein bottle [La triple bouteille de Bonan-Jeener-Klein]. See its u=v line with a strip. 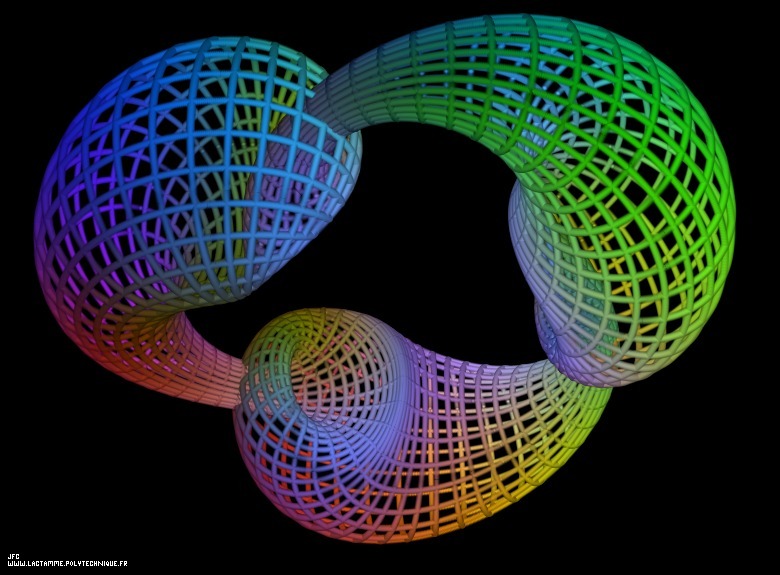 See an artistic variation on a geometrical inversion of the Bonan-Jeener's triple Klein bottle. See a special Bonan-Jeener's triple Klein bottle. Copyright (c) Jean-François Colonna, 2003-2017. Copyright (c) France Telecom R&D and CMAP (Centre de Mathématiques APpliquées) UMR CNRS 7641 / Ecole Polytechnique, 2003-2017.